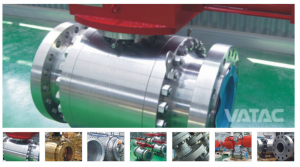 A trunnion ball valve has an additional mechanical anchoring of the ball at the top and the bottom, which is suitable for larger and higher pressure valves, Vatac Trunnion mounted Ball valves are With Soft or metal-seated Design putting a pre- mium on safety and usability. The Ball of trunnion ball valve is fixed, it does not move with medium pressure. Trunnion ball valve has floating seat, the seats move with the medium pressure to tight the ball and seal ring to ensure sealing reliability. Bearings could be mounted in top or bottom stem, which efficiently reduces operation torque. Which is suitable for widely service in valves with high pressure and big sizes. To decrease the operation torque and increase sealing reliability, lubricated ball valves are adopted in recent years. A special sealant is injected between sealing faces of lubricated ball valve to create a layer. This increase the sealing reliability while decreasing the operation torque, which is better for high pressure, big sized ball valves. ● Sealant Injection Device: Trunnion mounted ball valves are provided with devices for Sealant injection, which are on both the stem and seat for the trunnion ball valves of DN>150mm (NPS6), and in the body cavity for the valve of DN<125mm. When the O-ring of stem or the body seat ring is damaged due to accident, the medium leakage between body and stem can be prevented by injecting the Sealant through this device. ● Double Block & Bleed: The double block and bleed condition is available in all seat design configurations. When the ball is in the closed position the body cavity pressure may be drained down to ‘zero’ by opening the bleed valve and draining the fluid by removing the drain plug. Each seat works independently assuring tight shut off seal against ball on the upstream and downstream side. ● Anti-static: Except for the anti-static features floating ball valve has, the trunnion ball valve has more. The ball of the trunnion ball valve gets close contact with each other through the trunnion, adjusting cushion, and down-end cap, the passage of static electricity thus forms together with the valve, which may lead the static electricity caused by sparks generated by friction between the ball and seat during on and off performance to the ground to prevent the possible risks of fire or explosion. ● Fire Safe: With the valve heated or occured in a fire application, the nonmetal material parts such as seat sealing ring of PTFE, O-ring for the stem, and sealing gasket for body and bonnet, might be damaged due to high temperature. Vatac’s auxiliary metal to metal or the graphite specially designed seal is suitable for the trunnion ball valve to effectively prevent both internal and external leakage of the valve in case of fire, As required by customers, Vatac’s fire safe design for the trunnion ball valve meets the requirement of API 607, API 6Fa and BS 6755.